Can you go swimming with it on? How long will the Apple Watch go before it needs a charge? Update: It appears you can replace the battery of the Apple Watch, though you won't be able to grab a screwdriver and do it yourself. According to the fine print on Apple's product pages, a warranty from Apple will cover a replacement if your Apple Watch's battery loses 50% or more of its capacity. If that happens you'll be able to bring your Apple Watch to an Apple Store to get a replacement battery, much like you can with iPhones, although there's currently no news on how long this warranty lasts. Apple's Spring Forward event gave us a closer look at the upcoming Apple Watch, and now the Cupertino company has provided some more information about the battery life and water resistance of its wearable. 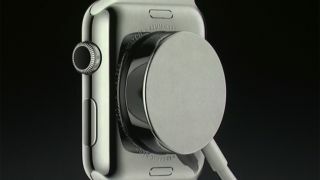 On stage Tim Cook, the CEO of Apple, announced that the Apple Watch will run for up to 18 hours per charge, however Apple has also posted a battery test result page that reveals much more information about how long we can expect the Apple Watch's battery to last in various use cases. The 18 hour claim is based on tests performed by Apple with an Apple Watch paired with an iPhone and used for 90 time checks, 90 notifications, 45 minutes of app use and a 30-minute workout with music playback from Apple Watch via Bluetooth. Other tests showed that the Apple Watch's battery lasts 6.5 hours when streaming audio via Bluetooth and up to three hours when used to make and receive voice calls. A workout test, where the Apple Watch measures your heart rate, lasted for seven hours. If you just want to use it as a watch you'll be able to check the time five times per hour for four seconds a go for up to 48 hours, according to Apple's tests. When the battery reaches a certain level the Apple Watch will switch to Power Reserve mode, which will allow you to continue checking the time for up to 72 hours. According to Apple's tests this will let you check the time four times an hour for up to four seconds per glance. When the battery is completely dead it should only take one and a half hours to charge to 80%, and to fully charge the Apple Watch you'll need to plug it in for two and a half hours. Perhaps most interestingly, Apple has confirmed that the 42mm Apple Watch typically experiences longer battery life than the 38mm Apple Watch, so if you're after extra battery life you'll want to go for the bigger Apple Watch. Apple also revealed more about how waterproof the Apple Watch will be. It has been certified as IPX7, which means it will be able to immersed in water up to 1 meter for up to 30 minutes. Apple says that this means Apple Watch owners can "wear and use Apple Watch during exercise, in the rain, and while washing [their] hands, but submerging Apple Watch is not recommended." This means that although the Apple Watch should be fine if you're caught in a storm, it's not recommend to go swimming or take a bath while wearing the device, which is a similar situation as the LG G Watch R.